To enable the reader to deal with the topic on hand it is necessary to explain what the topic actually is, as neither the quantum vacuum nor the planetary energy grid are common knowledge. The quantum vacuum is the realm of energy behind matter. In this realm there is neither space nor time and everything in it is interconnected. Conservative scientists generally do not accept the concept of this realm of energy behind matter. But there are several scientific institutions that do ground breaking research of different aspects of the quantum vacuum. The Oxford University in Great Britain has dedicated a department to research the possibility of a computer operating on the principles of the quantum vacuum. As there is no time in this realm a computer operating on basis of qbits, these are the equivalent of ordinary bits used in "normal" computers, would do all the computations in zero time. This means that the moment the data is put into the computer the result shows up on the screen. The smallest qbit computer will outperform the most advanced giant present day computers. At the California Institute of Physics and Astrophysics - CIPA - the possibilities offered by the quantum vacuum are researched in various directions. For instance, allegedly the Institute received a grant to research the possibility of a space drive utilizing the quantum vacuum. Such a drive would bring a space ship to its destination in zero time. Distances would not matter any more. The most distant star systems and galaxies would be reachable instantly as travel time in the quantum vacuum is zero. At the University in Innsbruck, Austria, researchers succeeded teleporting matter using the quantum vacuum. The test matter did not travel in a traceable trajectory to its destination. Instead it disappeared in one location and appeared in another one. This matter had overcome the distance between departure and arrival destination in the quantum vacuum. This means the transport was instant. Even though science had to accept and has accepted the concept of a quantum vacuum it is not scientific main stream yet. - An avalanche does not start out full size. A little snowball can trigger an avalanche that is growing in speed and force as it is thundering down a mountain slope sweeping away everything in its way. Likewise, the science of the quantum vacuum will rapidly become ever more important and ultimately it will eclipse everything conventional science has to offer. The quantum vacuum is the last great frontier of science. The above examples give but a modest glimpse of its possibilities, which are endless. The planetary energy grid is better known to the few interested in such topics as the energy grid of the ancients. - In antiquity religion was very important and temples and sanctuaries were erected all over the planet. Researchers of all sorts studying the Aegean Sea and Greece remarked a peculiar pattern in the location of such places. When connecting the temples and sanctuaries of the area with straight lines a grid like pattern emerged. Looking for this pattern elsewhere the researchers found it wherever they looked all over the world. In Great Britain not only the corners of the grids are known. There people talk of so-called ley lines, which are known to run through the country side. These ley lines are said to have a special force or energy associated with them. Remarkably, at the crossings of these ley lines frequently ruins of ancient sanctuaries of temples can be found. Over time Christian churches replaced many of these. There were attempts to measure the energies of the ley lines as well as the special energies assumed to be at the locations of the grid where ancient sanctuaries can be found. Weak electromagnetic fields sometimes can be measured on such locations. But none of these attempts came up with any kind of energy that could be put to use with the means of our technology. Actually, with a little logical reasoning one can easily find out the important nature of these energies and why they cannot be measured. Temples, sanctuaries and churches are structures designed to deal with spiritual energies. Worshippers deliver their spiritual energies to a specific religious place, a temple or a sanctuary, which belongs to a specific god. Hence, it is logical to assume that the ley lines and especially the crossing of these ley lines have some kind of a connection with spiritual energies. These cannot be measured with any technical means. The above conclusion bears great significance because one has to assume that the ones determining the location of the sanctuaries were the beneficiaries of these structures, the gods. They knew about the spiritual powers of these places and they were the ones to implement rituals and religious ceremonies to take full advantage of the spiritual energies the worshippers delivered. Hence, these gods must have existed. The many reports of gods living among humans during ancient times have been discarded in error. Temples, churches and sanctuaries can be found all over the world. For the last 5500 years innumerable structures were erected for the purpose of supplying spiritual energies for the gods. This makes only sense when the spiritual energies were and still are very important. In antiquity every city had its town god. Every house in the city had its little altar for worship and every town had at least one and more often numerous temples. These are known facts but nowhere is mentioned why this was so and what happened to the spiritual energies delivered to a god or goddess. People who know the importance of spiritual energies, which also can be called the energies of the quantum vacuum, also know how to make use of them. Therefore, it is very clear that the gods of antiquity put the energies delivered by their worshippers to use for spiritual work respectively to achieve something in the realm of the quantum vacuum for which they needed these energies. The power of prayers often is invoked if someone is in distress and asks a higher being for help. On a larger scale there is the example of the Japanese being threatened by a Mongol invasion force of more than four thousand ships and one hundred thousand men. The Japanese resorted to praying to their gods and this they did for months. When the Mongols attacked a horrific Taifun, a storm we call Hurricane sank the Mongol fleet. - Coincidence or power of the gods? The gods of antiquity disappeared and monotheism replaced polytheism in most parts of the world. Christians, Muslim and Zoroastrans worship the same one and only god. For many centuries the spiritual energies of many millions of people were directed toward this god who is called almighty. The spiritual energy this one god has accumulated must be awesome, beyond comprehension. His power could really be great enough to give Him spiritual might over all. Prayers and rituals are a very important part of every religion and they program the energies of the quantum vacuum, the spiritual energies. In ancient times this was a known fact. Elaborate spring rites, for instance, were designed to make sure harvests would be plentiful in the upcoming agricultural season. The gods were another part of this equation because they were expected to do something with the energies they received. For instance, Ceres, the Roman goddess of the grains who also gave name to our cereals, was expected to make sure that there was a plentiful harvest. The god of storms had to make sure that these did not do damage to the harvest or to life. In fact, when the disaster of 3100 BC destroyed much of Sumeria in gigantic flood horrific winds destroyed much of the country that was spared by the flood. In Sumeria ruled a council of gods called the Annanaki and the god of storms was the president. After the disaster he was blamed that he had not been able to do his job and he was demoted. The Sun god became the new president of this council. In polytheistic pantheons every god or goddess had a department he/she was responsible for. Monotheism has only one God who is said to be almighty. In the course of many centuries this God has accumulated unimaginable spiritual power. How is He going to put them to use? Jesus of Nazareth was the founder of Christianity and he gave the answer to this very important question He announced the coming of a world of love and peace. He also said: "my kingdom is not of this world". With this it is clear that he really was speaking of this world coming to an end and a different, positive world come into existence. He actually talked of a change of worlds, which also could be called a change of dimensions. Clearly, for such a gigantic spiritual project the one programming it will most definitely need immense amounts of spiritual energy and Christians, Muslim and Zoroastrans are the ones providing it. While religion has known the energies of the quantum vacuum, the spiritual energies, for a long time and has put them to use science only recently has caught up with this realm. At long last common ground has been established for science and religion. Science has a lot of catching up to do. In the last decades many UFO sightings were reported. In Great Britain it was noted that these aerial crafts followed the course of ley lines. Remarkably, this course was not straight. The word used most often to describe it is "erratic". Even more remarkably, these crafts did right angle turns at the crossing of such ley lines at a very high speed. Acceleration, deceleration, gravity and inertia have the same effect on matter. Why were the crafts and its crews not crushed by such right angle turns? Conventional science is at a loss to explain such phenomena. Considering the possibilities of the quantum vacuum this unusual behavior of the UFOs makes a lot of sense. We have established that the ley lines are "outcrops" of the quantum vacuum, which connect the planet in an energy grid. Different kinds and amounts of mineral deposits located near these lines are responsible that the ley lines are not straight. This explains the erratic course of the UFO's. The UFOs following these lines means that they utilize the kind of energy emanating from them for levitation, propulsion and other things we don/t know they even exist. It also means that the UFOs must employ some kind of mechanism, which separates them from the surrounding material dimension. For them there is no erratic course and there are no right angle turns. The UFOs maintain a dimension of their own and, thereby, do not experience any influence from the material dimension around them. The only way to do this is utilizing the possibilities of the quantum vacuum. In the quantum vacuum there is no material dimension, no space or time. As there is no space there are no right angle turns inside the craft. It would be an exercise in futility to guess what kind of advanced technology utilizing the quantum vacuum there is in a space ship. This example serves a different purpose: to show that there is an energy source, which can be used all over the planet. It has to be assumed that such energy lines exist in space between star systems. Consequently, there is an inexhaustible source of energy available for space travel, which makes space travel possible. Even more remarkably, the quantum vacuum provides a further ingredient to make space travel possible: it takes the craft out of the material space/time dimension and transports it in zero time to its destination. 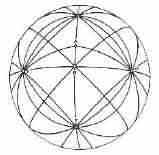 The planetary energy grid is an expression of the quantum vacuum. It also shows there is an inexhaustible supply of energy, which can be put to use to end the dependency on fossil fuels. The above examples have shown that the quantum vacuum offers practically limitless possibilities in every respect. The first little snowball of quantum vacuum research and use has been started at Oxford University, the California Institute of Physics and Astrophysics and other scientific institutions. It is just a question of time for this little snowball to grow into an avalanche of knowledge of the quantum vacuum, which will come thundering down on most of the tenets of matter science and cast them into oblivion.